My latest Plus report (35 pages) is all about focus and how focusing in the right way is incredibly important for your future growth. The fundamental problem today is that the old formula for growth doesn't work anymore. In the old days, growth was about creating a 'middle-market' where, once you stopped growing in one area, you would expand to another, and then another. Over time, you ended up with a wide middle-market publication that had enough of everything to appeal to a bigger market. In the digital world this middle-market growth formula makes you irrelevant, because we don't want to end up as yet another magazine with no real focus. So, in my latest Plus report, I go into detail about what this trend is all about, why it works the way it does, and how you should think about growth instead. I usually don't mention specific reports in this newsletter, but I want to make an exception... because WAN-IFRA has published a report called "Engaged Readers Don't Churn - Retention lessons for digital subscriptions", written by Cecilia Campbell. And it is excellent. She has interviewed some very interesting publishers and analysed the growth, retention, and churn strategies. Publishers like Aftenposten (Norway), Aftonbladet (Sweden), Amedia (Norway), The Boston Globe (USA), Brunswick News (USA), Dagens Nyheter (Sweden), Le Figaro (France), Mittmedia (Sweden), Politiken (Denmark), Schibsted (Norway/Sweden), Süddeutsche Zeitung (Germany), Svenska Dagbladet (Sweden), Telegraph (UK), The Washington Post (USA), Welt (Germany). There are two very interesting things in this report. One is that, while there are some overall patterns and trends in the market, the specific retention strategies vary greatly from one publisher to another, so there are many paths to success. And secondly, you will realize just how important a different view of analytics is, and how important it is to shift your mindset from specific metrics to overall business indicators. For instance, shifting from counting subscribers to measuring subscriber revenue. I do the same thing with Baekdal Plus. We all want to grow the number of subscribers we have, but what's more important is to look at the revenue that generates. Would getting more annual subscribers drive more revenue in the long run? Would a certain type of monthly subscriber generate more short-term activity, but cause less (or more) revenue overall? The report is not free. It's 150 EUR. But, I just love how it goes into the details of how all the publishers above are thinking about this at their end. WAN-IFRA: "Engaged Readers Don't Churn - Retention lessons for digital subscriptions"
Speaking of churn... how to measure it? There is no clear benchmark for churn - indeed it's one of the trickiest KPIs to nail down. Added to that, once you've decided on a meaningful way to measure it, taking relevant actions based on the results is much less straightforward than boosting slumping sales. And be aware - low churn numbers sound good, but they could be related to low sales activity, which of course means low growth. Some publishers measure churn per quarter, per month, or per week by simply measuring how many people they lose compared to whatever the total is at that moment ... and that's nice, but not really informative. First of all, don't look at churn as merely a metric. As in, don't just measure the number of people who unsubscribe and then just leave it at that. Instead, think about churn as something that is intended to measure momentum. When someone unsubscribes, what's important to know isn't that they are gone, but for how long they had subscribed before leaving. Because what you want to do is to optimize for subscriber longevity. In many ways, this is the same as when you think about employee turnover rates or more specifically, the average tenure. At any company, there is an average number of years that people will stick to the same job before they decide to move on. 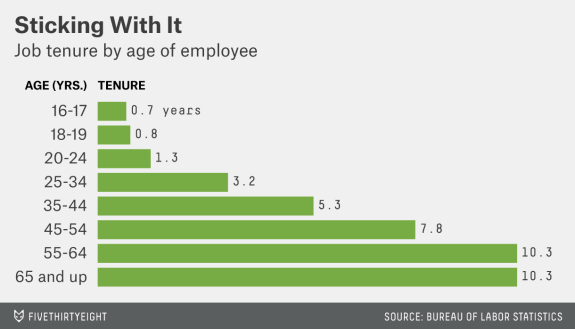 And in the job market it's something very heavily defined by age. Young people, for instance, only stick with the same job for 1.3 years, and then it goes up from there. So, a key metric isn't the percentage that you lose per year, but for how long they stuck with you before leaving. For instance, if you can create a company that would entice young people to stick with you for 2.6 years, that would be a very important indicator you are doing something right. And it's the same with publishers. The key metric for churn isn't the percentage of people who churn, because everyone churns at some point, but instead to look at their tenure as a subscriber. When people churn, did they stick with you for longer than, say, a year ago? Secondly, you really want to be able to segment your churn instead of just looking at everyone as a whole. Again, this is similar to the job market. If you know that 20% of your employees are going to move on per year, it's incredibly important to also know whether those 20% are your high-performers, or if they are merely the low-performers. You don't want to lose 20% of your best people, because that would indicate a massive internal problem, but if it was just the low-performers, well... that's still bad, but they weren't fully committed to begin with. It's the same with publishers. Most of us have several types of subscriptions. For instance, I have monthly and annual subscriptions, it's very important to know whether the people who churn are annual or monthly subscribers. Also, be very mindful about how people subscribed in the first place, and segment that as well. Did they subscribe organically, because they had a genuine interest, or did they subscribe because of some marketing push that you did, where you gave everyone 70% off for the first 6 months? Obviously, the discount is going to produce a much higher level of churn, so here you don't just want to learn about churn, you can also use it to learn whether giving people a discount is even a good idea in the first place. You also need to look at what people were doing when they were a subscriber and then segment that as well (note: GDPR makes this slightly complicated, but that's a separate discussion). Finally, sometimes churn isn't the problem, but your 'replacement rate' is. What I mean is that some types of publications will have 100% churn simply by design, so here what you want to focus on is how good you are at building up things like word-of-mouth so that you are continually bringing in new people. This may sound weird to you, but let me give you an example. 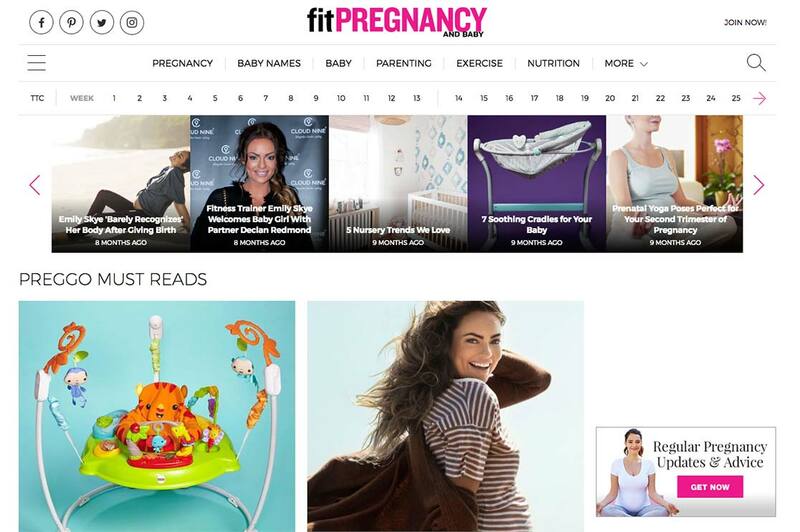 Think about a company like Meredith, who used to have a magazine called Fit Pregnancy (which has now been merged with their 'Parents' magazine). 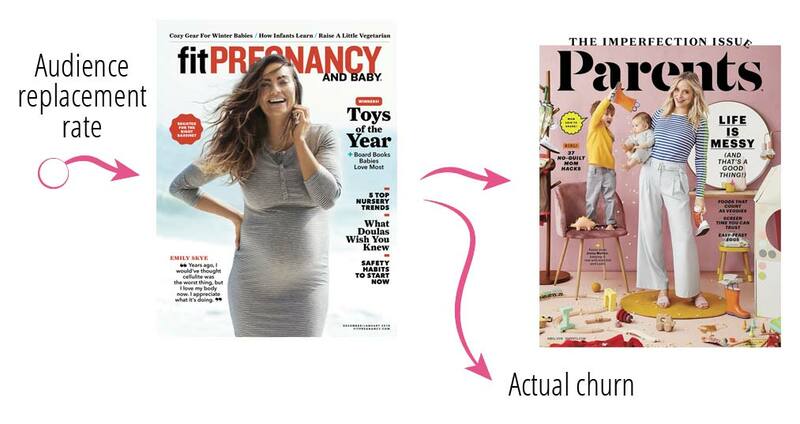 This was a great magazine for people who are pregnant (or so I'm told, since I don't have kids), but it's a type of media that will have 100% churn rate within 1-2 years. And the reason is obvious. It's only relevant for people who are pregnant ( a period immediately before and after). So, for a magazine like that, managing your churn rate was much less important than managing your replacement rate. You don't want to keep people around when they are no longer pregnant, because that would just lead to other problems (like really bad results for advertisers, shallow interests, and confusing editorial strategies). Instead, since Meredith also runs several parenting magazines, the real goal is to get people to 'move on' to these other magazines. So, you start the relationship with Fit Pregnancy, and then, after 9 months, you focus your churn on bringing people to your parenting magazine. And this is exactly what Meredith did. Fit Pregnancy has now been merged with Parents, so now when you visit them, you have a clear path from pregnant, to baby, to bigger kids, to being a parent. In other words, they now have an internal churn strategy within the magazine itself. So, churn is not just a metric. It's much more complex than that. Think about churn as a form of momentum. How can you extend your momentum, and how can you move it to other and more relevant things when the time is right?